This Commemorative Sheet traces the history of this famed fighting force who have served the British Crown for 200 years. Gurkhas have played a vital part in British military operations since the raising of the first Gurkha regiments in 1815. Originally part of the British Indian Army, they fought Pathans on the frontiers, dacoits in Burma and mutineers in India. With six battalions on the Western Front, four in Gallipoli and others in Mesopotamia, Egypt, Palestine, Persia and Salonika, Gurkhas were prominent in the First World War, and similarly so in the Second World War, where they served in North Africa, Italy, Malaya and Burma. After 1947, Gurkha regiments were divided between the armies of independent India and Britain, with British Gurkhas in the forefront of operations in Malaya and Borneo, and subsequently taking part in the Falklands campaign, and more recently in Bosnia, Kosovo, East Timor, Sierra Leone, Iraq and Afghanistan. 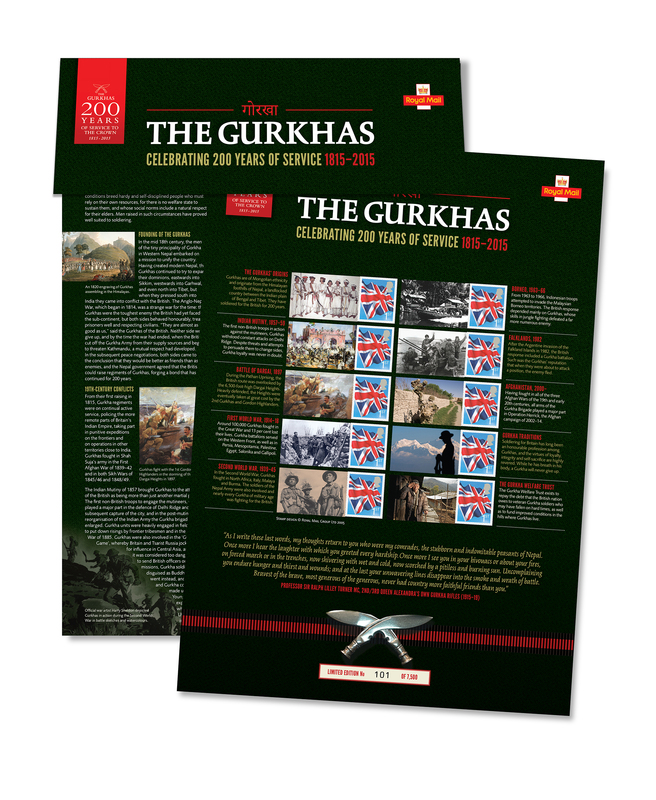 Ten labels illustrate the history of Gurkhas from 1815 in the foothills of the Himalayas to recent operations in Afghanistan and the work of the Gurkha Welfare Trust. Contains ten Union Flag stamps and is a limited edition of 7500. Obtainable from The Gurkha Museum Shop at £14.95 plus postage and packing. 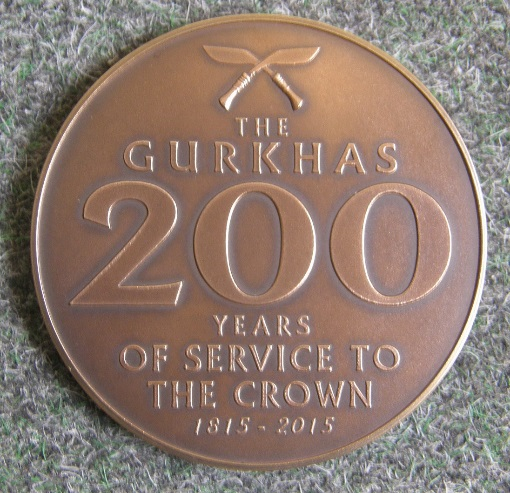 The Brigade of Gurkhas have issued a fine Commemorative Medal to celebrate 200 years of Gurkha history. Created by Alfred Pain FRSA, BA Hons, himself a former Gurkha Officer and a Member of the Contemporary British Silversmiths. 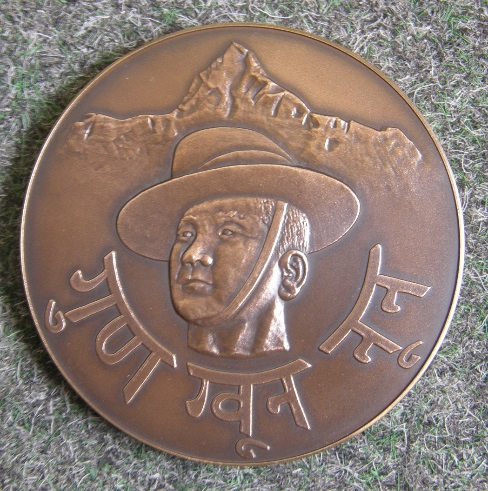 The Medal bears a Nepali inscription “Gun, Khun, Nun” (because of quality of military heritage, blood spilled and salt [oath]) chosen by the legendary Col J P Cross summing up Gurkha Service to the Crown over 200 years. The 57 mm Medal, cast in solid bronze, has been produced by Bigbury Mint in Devon who pride themselves on high quality workmanship with excellent service. Available from the Gurkha Museum. Product Code 996. Price: £35 + £4.50 postage and packing. 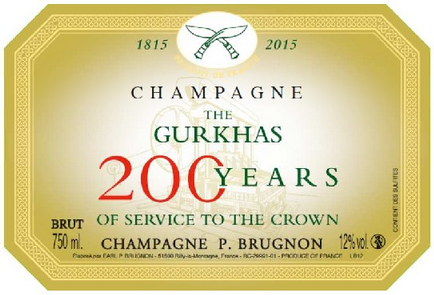 A special cuvée of Champagne has been created to mark the 200th Anniversary of The Gurkhas service to the British Crown. The Champagne is from Philippe Brugnon’s Premier Cru vineyards of Rilly la Montagne. The profit proceeds from the sale of this Champagne are donated to The Gurkha Welfare Trust. Philippe Brugnon and his UK agent, Julian White, are pleased to be associated with this great cause – a charitable trust that supports these distinguished and valiant soldiers now retired and living back in Nepal. The Gurkha Welfare Trust is the leading Gurkha charity, providing financial, medical and community aid to Gurkha ex-servicemen of the British Crown. The Champagne is available from the 21st March 2015 from Julian White Agencies. The Price including delivery and VAT is £26 per bottle, £147 per case of six, £143 per case of six if ordering 2 or more cases. This applies to the UK Mainland excluding Scotland; please enquire for deliveries to Scotland quoting the postcode of the destination. 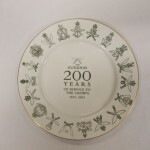 The Headquarters Brigade of Gurkhas (HQBG), in conjunction with the Gurkha Museum (GM) has organised the production of a bone china plate (Approx 10 ½”) showing all of the badges of the past and present units of the Gurkha Brigade with the G200 logo at the centre of the plate. The cost of the plate is £29.95 including P&P, or £27.75 if collected direct. Full details with picture and order form are attached. We are prepared to arrange for bulk orders (for a group of 20 or more customers from one location/unit PRI’s) to be transported within the UK @£27.75 per plate, which includes packing. To commemorate the 200th anniversary of the Brigade of Gurkhas serving in the British Army a limited edition watch has been designed by Breitling through Andrew Michael’s Jewellers (AMJ) and will be sold at a discounted price to all serving and retired members of the Brigade. The design of the watch (similar to that commissioned by the RGR) can be seen by clicking here: G200 is a Brigade event and this watch aims to encompass our current and past units, all under our current Brigade of Gurkhas capbadge. 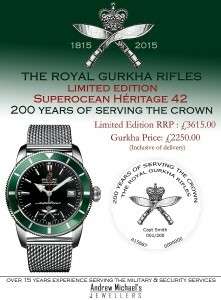 Any personnel wishing purchase this unique time piece should fill their personal details in the attached spreadsheet(click here for ordering spreadsheet) and email back to the undersigned (manprakash127@hotmail.co.uk orPrakash.Rai321@mod.uk ). Please do not collate the details from others and send collectively. For ease of contacting personnel it is requested that each person send details individually. A civilian email address is preferred as it is more accessible than military DII. Once your order has been received individuals will be notified. Individuals may request a preferred watch number (1 – 200) however watches will be allocated on a first come first serve basis (as they appear in my email inbox). Please do not delay. The aim is to get 200 orders, if there are more than 200 orders Breitling will donate £4,000 to a charity of HQBG’s choice. Cut off date for the return is Thursday 24th Jul 14. A collated order form will then be sent to the AMJ and they will contact individuals to register an account on their web portal. AMJ will take over the entire administration and sale process from this point onwards. Once the AJM account has been activated, a deposit of £100 must be paid. Once the deposit has been paid it will be up to the individual to manage their own accounts. The best way to do this is to set up a direct debit for a set sum each month so that the cost is spread. The amount paid each month is up to the individual. The payment scheme is flexible and additional payments can be made. Any outstanding balance must be paid in full before the watches are distributed in Feb 2015.